How Much Does a Fiberglass Swimming Pool Cost? There are basically three different types of in ground pools: concrete, vinyl liner and fiberglass. The first two types are built on-site while a fiberglass pool's shell is already manufactured, then installed on site. The main advantage of a fiberglass pool is that over the long term it will require far less repair maintenance than concrete or vinyl. Concrete will eventually need to be repainted or resealed and a vinyl liner will eventually have to be replaced. On the other hand, if properly taken care of, a fiberglass pool's interior finish will last much longer. The main consideration of installing a fiberglass pool is the upfront cost. While every fiberglass pool manufacturer will have its own specific pricing, the following is a general price range for a basic fiberglass pool package and everything that entails. The basic package consists of the pool itself, a filtration system and all the necessary plumbing material that is required. The owner would be responsible for all labor and additional material costs associated with the installation process such as excavation, backfilling, water, concrete, electrical work, fencing and the regrading of the yard. Unless you are qualified and have the experience to properly excavate and install an in-ground pool, or will be working with technicians that are, it is not recommended that you attempt this as a do-it-yourself project. The overall cost for a self install would be $12,000 to $30,000 depending on the actual size of the pool. If you decide to have a qualified fiberglass pool construction company professionally install the pool, then the overall cost would be $20,000 to $45,000. This will generally include the pool shell, filtration system, site excavation, setting of the pool, backfilling, filling the pool, filter installation and pool permit. This price does not include any concrete decking around the perimeter of the pool. The owner is still responsible for the electrical hook up, all concrete work, regrading the yard, cleaning the pool and any required fencing. 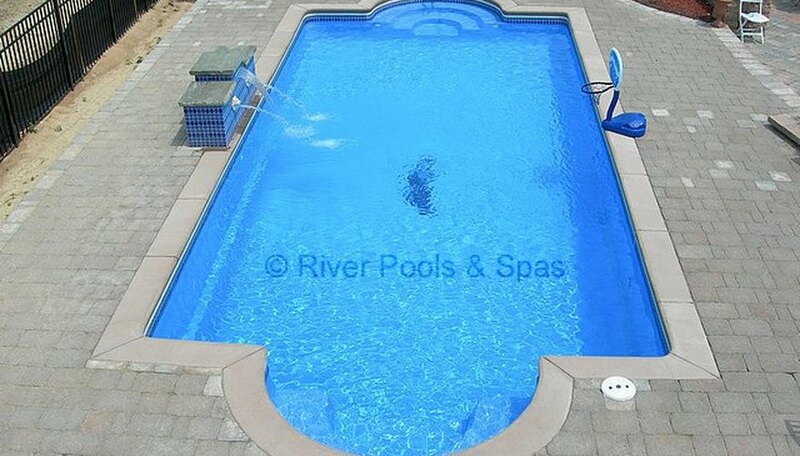 This package is the same as the basic fiberglass pool package with installation, however the price includes a 3-foot perimeter of concrete decking around the entire pool, regrading of the yard to a smooth, rock and gravel free surface, and the initial cleaning of the pool area and water. The owner would still be responsible for all required electrical work as well as adding fencing that meets the local building code requirements. The price range for this fiberglass pool package is from $30,000 to $60,000. The complete fiberglass pool package will provide everything involved in the installation process including electrical service and fencing. Not all pool companies will offer this service, so if you are looking for a complete turn-key project make sure to ask what is actually included in the total price. The complete fiberglass pool package will cost from $35,000 to $75,000 with the average price falling between $45,000 and $65,000. In each of these scenarios, there still is a pretty wide gap between the low and high end of the pricing spectrum. While the overall size of the pool will have the biggest effect on price, other factors include such features as lighting, additional skimmers and water return lines, waterline tile, colored or patterned concrete decking, filtration system just to name a few. It is recommended that you determine what options you are looking during the design phase of the project in order to generate an accurate final cost. David Schwab has worked as a freelance writer for three years for various websites including Cappers Picks, ATS Sportsline, SportsBook Lists, and Demand Studios as well as on several independent projects. He has a BA in International Relations from Lehigh University and is an accredited associate with the Institute for Independent Business.